The fires of hell that threatened to consume them appear to have died down, the flames subdued, the smoke clearing. At least for the time being. The gates of hell that promised to imprison them have opened wide, the chains broken, the locks shattered. Certainly for now. 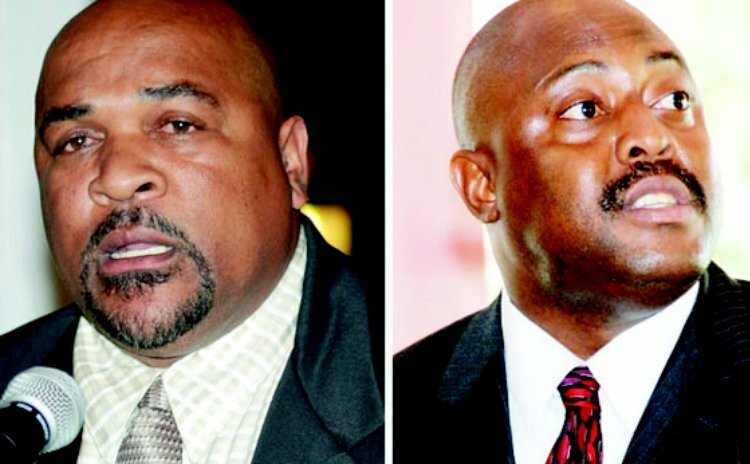 The darkness of hades that threatened to engulf two of the most secure Dominica Labour Party (DLP) candidates, condemning them to possible eternal political damnation, has lifted, the light beginning to shine upon them again. "Everything has settled down nicely," a member of the DLP hierarchy told The Sun in reference to the cases of the Cottage MP, Reginald Austrie and his Portsmouth colleague, Ian Douglas. Both men's positions as flag bearers for the DLP in the next general election were under threat in recent times. Mervin Paul, the head of the Government Information Service (GIS) and an unabashed and unapologetic mouthpiece for the DLP, had been placing himself in position to wrest the candidacy from Austrie. But the Cottage MP quashed any thoughts of a challenge with his forceful declaration during the budget debate that "I shall not be part of no primary." This, according to one DLP source, forced Paul to retreat. "Mervin Paul has disappeared into the sunset quietly going back to what he was doing," said the leading DLP official who spoke to The Sun on the usual condition of anonymity because he did not wish to risk the wrath of the prime minister. Differences between the prime minister, Roosevelt Skerrit, and Douglas, the Portsmouth MP, have been well publicized. The recent dispute over housing lots in Douglas' constituency and the MP's strong criticism of the prime minister, highlighted the bitter schism that exists between the two. "The Labour Party of today (under Skerrit's leadership) no longer has the best interest of the average Dominican at heart. This Labour Party is only interested in winning elections," a leading party official admitted to The Sun, adding that this was one of the issues that troubled Douglas. In a 26 August article, The Sun reported on a number of candidates, many of them sitting MPs, who the prime minister wanted replaced, quoting a source who indicated that Skerrit had been driven to the edge of impatience by the cockiness and bewildering and confusing displays of nursery school politics by some who felt invincible. "He has a problem when the MPs think they cannot be touched," the source was quoted as saying. Still, the high-ranking DLP official who spoke to The Sun for this story seemed perplexed as to why two people who so easily win their seats – Austrie won the last election with 86 per cent of the votes – were targeted to be thrown into a bottomless pit. "I have no idea," this person told The Sun. "I myself can't figure it out. Two stalwarts of the party in two constituencies who would be an asset to the campaign, I still can't figure it out. It doesn't make sense creating an upheaval in these two strong constituencies…that you are going to win anyhow and in the meantime you lose two marginal seats." This is the argument that Austrie, in particular, has made very strongly, the source told The Sun, and this is the position both the Cottage MP and Douglas have held on to. Quite firmly. "Both made it clear and held (their) ground so they (Skerrit and those who wanted them out) capitulated. There will be no primary in Portsmouth or in Cottage for that matter." For both MPs, it appears that hell no longer hath any fury and the fires of hell have been extinguished.